At last, you can get a real FLASH drive! It’s been several years since Mimoco bought the license to produce DC character-themed USB thumb drives. Of course they started with the usual suspects: Batman and related characters. Green Lantern got a push when the movie came out. You’d think that a Flash-themed flash drive would be an obvious choice, but I suppose they were playing it safe. Well, the wait is finally over: You can now buy a Flash Mimobot drive with 8GB, 16GB, 32GB or 64GB capacity. 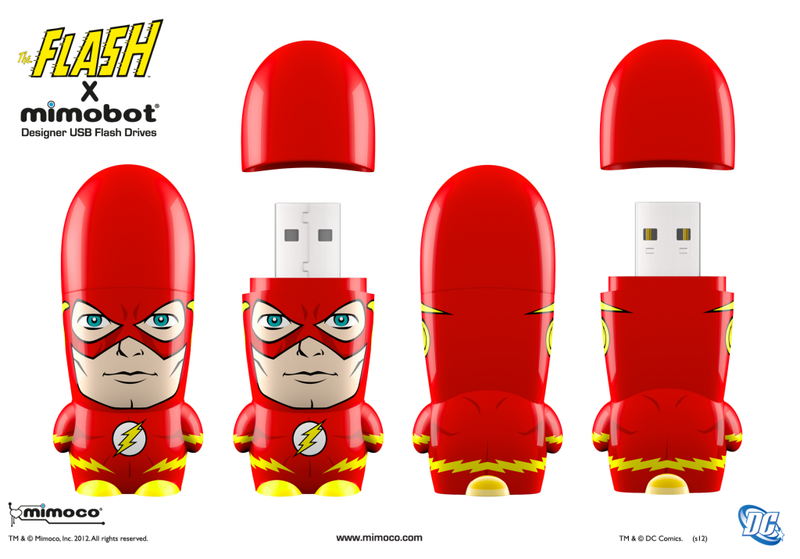 Store and transport your data at lightning fast speeds with the ultimate self-referential flash drive of all time, the Flash MIMOBOT designer USB flash drive. Could there be a more perfect character for a character-based flash drive? The answer, of course, is no. Truer words, Mimoco. Truer words. Thanks to Christopher Schmitt for the tip! 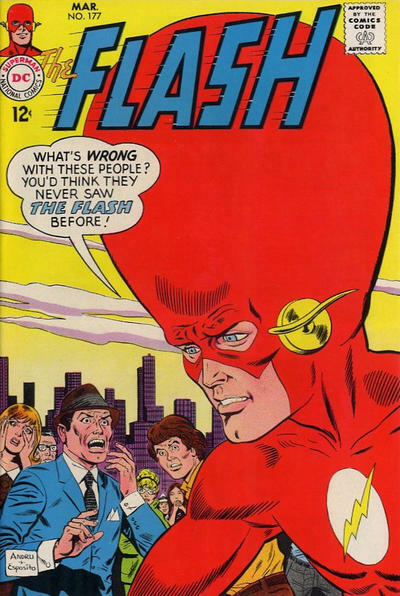 Flash #177 cover, via Comics.org. This entry was posted in Collectibles and tagged Mimoco, USB on June 12, 2012 by Kelson. For reasons I cannot explain…I want it. I’ve had an ongoing ban on Barry Allen products for the last 6 months or so (except for a couple of things that have slipped through). That ban is done. Ordered. I would like to have at least the Superman and Flash…if I can just convince myself some more that those eyes are sort of *greenish* blue enough…close enough…that it *might* be Wally with an unfortunate color mistake. I mean, the eyes aren’t all that blue, are they? Dang. I’m going to go back in and see if there’s also a Nightwing in blue and black. If the eye color is close enough and I put him next to Nightwing then its *got* to be Wally….even if I have to squint a bit. Sorry, accidentally pushed ‘post it’ before I finished it. Anyway continuing from my last post. Barry isn’t such a bad character to like. I’m not boycotting Barry per say….I’m boycotting DC’s shoving Barry down my throat. A few months before DC announced that categorically Wally was not in the DC52 I’d pre-ordered an expensive Barry Allen/Flash statue because I was still excited about the (admittedly fading) possiblility of Wally’s return and being “awesome” in the books if not necessarily in the same stories as Barry. *sigh*. I’m not advocating boycotts. *I* am boycotting. It’s a personal thing that I fully realize most won’t understand. ‘Kay? ‘Kay, I respect your decision even if I don’t get it. I wonder if people boycotted DC after COIE when Wally was shoved down people’s throats? *sigh* I see I’m going to have to add variations of “shoved down throats” to the moderation triggers. And Nick, there’s a big difference between the way DC replaced Barry with Wally and the way DC replaced Wally with Barry, specifically in terms of the way they respected and continued to acknowledge the other character — or didn’t. This isn’t the place to go into it, though, and I will start removing comments if this comment thread threatens to turn into that debate. I apologize, Kelson. I wasn’t intending to start a snipefest. My comment was more rhetorical in nature. Well, Wally made plenty of guest appearances in other books where the colorist hadn’t gotten the memo and gave him blue eyes. You can always declare it’s from one of those. True and I was almost sold on getting a JL set when I remembered the utter hassle of my state’s new foreign purchases laws (not charged sales tax) and the hefty fines if you make an error. Am going to wait and see if someone local is selling so I don’t have to get caught in some headache years hence. Family life is not the best right now so I can just see myself forgetting to save the receipt then getting audited up and paying hefty fines. Want to avoid this more than anything. Glad I read the comments this far, I was about to point out that Wally’s eyes tended to change color for much of his early career as the Flash, so you can easily pretend this is Wally (I know I am!) plus if you really need to convince yourself you just have to remember that Wally was the one who updated the costume with the angled lightning at the waist. That being said he’s super cute and I already ordered mine. Also I miss Wally too, and while I prefer Barry in the mentor capacity I still like him on his own too, but I can see where all of you are coming from. BTW I ordered the 8GB because he wasn’t more expensive than most standard flashdrives and I don’t think I need more than that. Does anyone actually need a 32 or 64GB flash drive? I was sort of surprised by those! Yeah, you can think of it as Hypertime or something. Ah! I saw those pictures of yours during this week’s google search and was all wtf’sthatWally’sIin? Wahahahaha! Also love his windswept do. Where’s LInda? That smirk on his face says he has a Linda home somewhere. Holy smokes! I want it! Mimobot prices have really come down over the years. When they started doing the Star Wars ones the price was extremely high. Must…have…Flash…Drive!!! I hope it works well. Once I bought a cheap-o drive and it had faulty memory. But for my favorite superhero I am willing to take a chance. Mimoco is really well-established, and I can’t recall hearing about any problems with them. I have one of the original R2 D2 flash drives. It has to be 6 years old now. It still works fine. My Flash drive arrived yesterday. I have only one problem: I don’t want to take it out of the box! The Big Head aspect is what I find kind of freaky (just like in the cover illustration Kelson provided.) Another freaky cover tie-in would be the one from Crossfire where Flash had all those computer cables attached to his head. Man, that Mimbot is getting more freaky overtones by the moment! Damn, and my birthday just passed, too. Take note! Six months to Hanukah! 64GB please! Now that we’ve got a Barry/Wally? Flash flash drive do you think they might one day make one of classic Jay and Impulse? Maybe if you beg hard enough. I just got one, and I swear to you, the eyes are green. You’re right, the eyes are green. I just got mine in the mail today and I actually took it outside so I could stand in the sunlight and asked my mom to take a look too (as an impartial judge) just to be absolutely sure. Maybe they already had the design done before the reboot stuff went down so we got lucky?